The merger of MobiFone and Vinaphone has been mentioned by experts and the media for over a year, but not until now is it included in VNPT’s restructuring scheme. The prevalent Decree 25 on the implementation of the Telecom Law disallowed an individual or an organization to hold stakes of over 20% in two telecom companies in the same market. 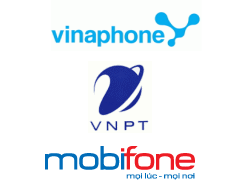 Therefore, experts predicted VNPT would divest its capital in either MobiFone or Vinaphone, or merge the two. Economist Nguyen Quang A also stressed the merger of MobiFone and Vinaphone would not facilitate the restructuring of the mobile service sector. Moreover, he deemed the merger a setback, as it would enhance the monopoly of VNPT, dissipating many efforts to eliminate this status. Such a merger is also inappropriate with the development of the country and will make life hard for other mobile operators. “Remember that the U.S. telecom industry only prospered after the government decided to break the monopoly of the telecom corporation AT&T,” said the economist. At the recent seminars, several senior officials of the Ministry of Information and Telecommunications have given comments on the merger of the two mobile networks. Pham Hong Hai, head of the ministry’s Telecom Department, said in case the two mobile carriers were merged, the market would be left with two major players –Viettel and VNPT. As such, the tripodal position formed by equally strong competitors will be erased, and it will be hard to maintain a healthy competition in the local telecom market. Meanwhile, Minister of Information and Communications Nguyen Bac Son expressed concern that Vinaphone would inhibit the development of MobiFone if the merger occurred. However, he supported the idea to merge the two mobile networks together, but demanded measures for both of them to develop further. However, Deputy Minister of Information and Communications Le Nam Thang asserted on Tuesday that the ministry had not considered any specific plan for the merger of Vinaphone and MobiFone. The deputy minister said prudent steps should be taken in restructuring the telecom market in general and VNPT in particular, because this will leave a negative impact on other players in the industry and mobile subscribers. The ministry will consult related agencies to decide on the most efficient scheme before seeking the Government’s approval. The telecom sector restructuring will be deployed under specific principles, such as to ensure that the State-run enterprises will operate more efficiently and achieve stronger competitiveness, creating a foundation for the local telecom market to develop in a sustainable way.